The editorial of the last issue of Taste&Flair. The monthly lifestyle magazine Taste&Flair, edited and published by Daphne Caruana Galizia, will still come out next month, featuring some of what could be her final work. André Camilleri, production manager at The Malta Independent, which distributes the magazine, said Ms Caruana Galizia had already started working on the November edition, having commissioned photographers and writers to work on the stories. However, Mr Camilleri said that while Ms Caruana Galizia had started laying the groundwork, she had not yet finished the magazine’s editorial, which she tended to leave to the very end, once all the content had been put together. Mr Camilleri added that it had not yet been decided who would be writing next month’s editorial and no further details on what content had already been completed were available as yet. Now in its eighth year, the magazine is distributed monthly. 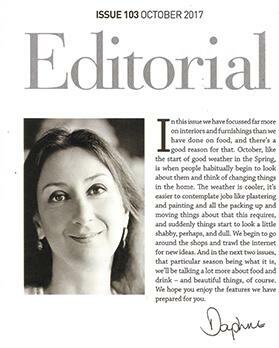 The content of the lavish lifestyle magazine, which offers home improvement tips and decorating ideas, as well as recipes, was very different to that posted on Ms Caruana Galizia’s blog, Running Commentary, and written in her newspaper columns. While her investigative pieces served as a platform for her prodigious skills as an investigative journalist, sharp political analyst and caustic commentator, the magazine showcased Ms Caruana Galizia’s eye for all things beautiful.